2nd Century A.D. - IIe siècle après J.C.
H. Leutemann (dates unknown), The astronomer Ptolemy putting up a stone, on the authority of the Aristotle commentator Olympiodorus (6th century), tablet in the temple of Serapis in Canobus commemorating his major astronomical achievements, 1876, engraving, dimensions unknown, in Göll 1876, p. 318. Inscription: at the bottom of the image "Claudius Ptolemäus weiht im Serapistempel zu Canobus eine Marmorteifel mit den hauptsägen seiner Astronomie." H. Leutemann (dates inconnues), L'astronome Ptolémée érigeant, sous l'autorité du commentateur d'Aristote Olympiodorus (VIe siècle), une stèle dans le temple de Serapis à Canope commémorant ses principales découvertes astronomiques, 1876, gravure, dimensions inconnues, dans Göll 1876, p. 318. Inscription: en bas de l'image "Claudius Ptolemäus weiht im Serapistempel zu Canobus eine Marmorteifel mit den hauptsägen seiner Astronomie." Very late is an engraving depicting, on the authority of the 6th-century Aristotle commentator Olympiodorus, the astronomer Ptolemy putting up a stone tablet commemorating his major astronomical achievements in the temple of Serapis in Canobus. The engraving, by H. Leutemann, is in Hermann Göll, Die Weisen und Gelehrten des Altertums, 2nd ed. 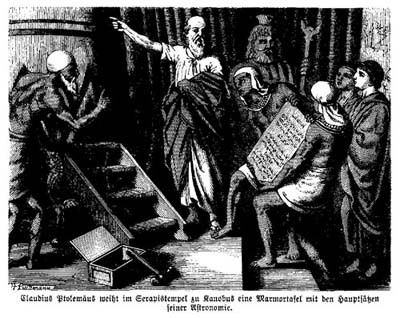 (Verlag Otto Spamer, Leipzig, 1876), p. 318. Robert H. van Gent, Utrecht. Göll 1876 - Göll, Hermann, Die Weisen und Gelehrten des Altertums, 2nd ed., Leipzig, Verlag Otto Spamer, 1876.